The redevelopment of the former Military Ocean Terminal in Upper New York Harbor into a 430-acre residential community, with shopping, entertainment and park destinations, and links to downtown Bayonne, light rail, and New York City. 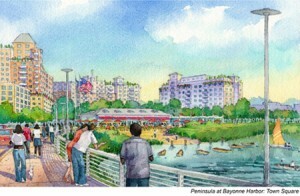 Are unused military facilities boons or banes for waterfront communities? For the City of Bayonne, the answer is the former. The project partners were able to see past the city’s abandoned army terminal and into the future — a golden waterfront redevelopment opportunity for Bayonne and the entire region. Bayonne’s shipping port terminal on New York Bay, built in 1932 to create additional industrial space for the city, was taken over by the U.S. Navy during World War II and the U.S. Army in 1967. Ships carried goods from the terminal for every major U.S. military operation from World War II to the Persian Gulf and Haiti missions in the 1990s. At its peak, the Military Ocean Terminal at Bayonne (MOTBY) employed 3,000 civilian and armed services personnel – many of whom lived in the area – and handled more than 1 million tons of cargo each year. But with the end of the Cold War and the subsequent decreasing need for the deployment of U.S. forces, the federal government decided to close MOTBY down in 1995, despite strong opposition from state and local officials. Jobs were phased out over the next three years; the closure was complete in 1999. But the value of this former naval supply center was obvious to some. In 2002, MOTBY was officially renamed The Peninsula at Bayonne Harbor by the Bayonne Local Redevelopment Authority (BLRA) – the city’s redevelopment arm. Plans were unveiled to redevelop the 430-acre former ocean terminal into a mixed-use complex. The project is currently underway; environmental cleanup and demolition are in progress; construction should begin by the end of this year. 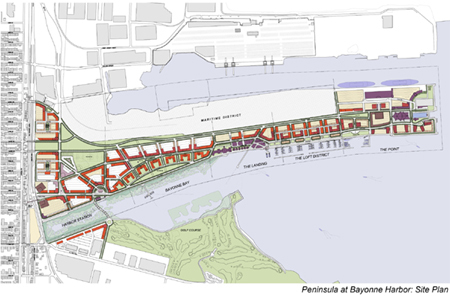 Integrating such a massive piece of land into a well-established city was not easy, but the project partners were particularly sensitive to this and determined to design, in effect, a new neighborhood for Bayonne that reconnects the city to its eastern waterfront. Mass transit connections to the rest of the city, mixed-use design in keeping with Bayonne’s other neighborhoods, and easy pedestrian access to the new development were important pieces of this carefully designed integration. The redevelopment plan envisions developing six distinct districts: Harbor Station, Bayonne Bay, the Landing, the Loft District, Bayonne Point, and the Maritime Industrial District. Included in the districts will be office space, a port facility, townhouses, apartments, two-family homes, a retail complex, a waterfront marina with ferry service to Manhattan, movie production facilities, a river walk, and a hotel. Royal Caribbean, which currently has an active cruise port located on the site, will continue to launch cruise ships from the site through the redevelopment process and beyond. Interspersed throughout the development will be parks and athletic fields. BLRA officials estimate that the development will be a major economic revitalization catalyst for all of Hudson County, generating 15,000 permanent jobs and a multitude of economic opportunities for businesses and industries throughout the region. The project’s location and mass transit links augur well for its success. The Hudson-Bergen light rail system stops on the project’s west side, giving Bayonne residents easy access to Jersey City, Hoboken, and Manhattan. The location of the project’s projected 18 million square feet of mixed-use space is unparalleled. Squarely sitting in New Jersey’s “Gold Coast,” only three miles from Newark and seven miles from Manhattan, the site offers unparalleled views of New York City and will give Bayonne’s 62,000 residents their first access to the Hudson River waterfront.